My experience with Eastern music is extremely limited. I’ve always enjoyed when The Beatles wove sitar into their music, but my knowledge of the varieties of instruments and styles in many forms of Eastern music don’t veer far beyond such excursions. Interestingly, I tend to enjoy Eastern music and Eastern influences in Western music when I encounter them – yet, I’ve never felt horribly compelled to explore them too deeply. Perhaps my days of lazily refusing to dive deeper are behind me, as the latest release from Santa Barbara’s Mah-Ze-Tar has me hooked. The album is entitled Liquid Lotus and it’s inspired by a wide array of these aforementioned influences that are little known to me. Maz Karandish – as Mah-Ze-Tar – does everything on this album. He sings, he plays all of the instruments, and – of course – he composed all of the music. 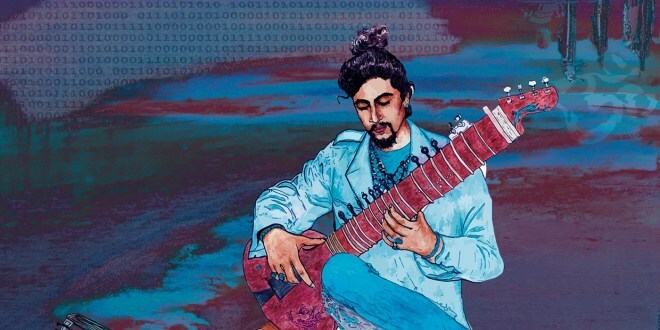 To create the unique blend of Western jazz and ambient music with a variety of styles of Eastern music, Maz uses sitar, oud, Turkish saz, dilruba and bansuri. A bit of googling reveals the rich and interesting histories of these instruments, as well as the musical traditions that use them. This album and a laptop are all you need to start a fun little music lesson – and, I have to admit that the album taught me a lot. Liquid Lotus soars through a plethora of musical traditions together in a meaningful way. There are endless possibilities when one utilizes world instruments and gliding vocals in sync with electronic textures and rhythmic grooves. Liquid Lotus uniquely fuses these elements together to create a sound completely unique and unheard of before. Using the traditional elements of Eastern music, his knowledge of Western music, and technology, Maz created a hynoptic album of 9 tracks that can be enjoyed by almost anyone. Even if you don’t find yourself interested in going down the rabbit hole of sounds and instruments, as I did, you can just as easily just allow the music to wash over you and aid you in relaxing or focusing for the day ahead. In other words, I really like this album, as it pushes me out of comfort zone into a whole new world of music.